It's that special time of year again when the Valley is awash with the scent of Wild Rose (Rosa Multiflora). Have you been lucky enough to catch it wafting on the wind like thick perfume? Anyone who knows me well knows I'm basically obsessed with this plant and with good reason- it's amazing! I first started thinking about working with it after reading folk herbalist Kiva Rose's work with the native roses of her New Mexico home. I've found our resident Rose to make good and powerful medicine, and have come to rely on it often both in my practice and personally. It's truly a treasure and such abundant bioregional medicine. Part Used: Flowers + Leaves (collected together). Hips. Habitat: Woodland and field edges, yards, bikepaths, farms, disturbed soil. Cultivation: Prefers full sun to part-shade. Wants to create a hedge and will sprout young bushes next to the parent bush. Tolerant of a very wide variety of soils. Description: Medium-sized, thorned shrub that can form a thicket. Compound leaves with 5 to 9 leaflets and feathered stipules. Multiple white (most common in our area) to pinkish flowers arise on corymbs in early to mid-June, are 2-4 cm in diameter, and have an incredible fragrance. They have the classic Rose Family 5 petals and numerous yellow stamens. 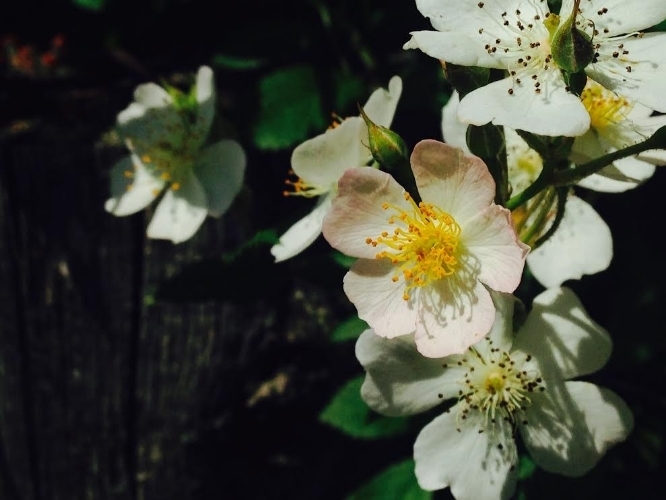 Herbal Ecology: Rose multiflora was introduced to the Northeast in the 1930’s originally to provide wildlife forage in the winter (rose hips), for soils stabilization, and living fences. It is now completely naturalized and found throughout all of the northeast, most of the central states, and the west coast states. Is not present in the inter-mountain west and Rockies. It can also be found in Canada, South Africa, New Zealand, and northern Europe. Originally native to eastern Asia- China, Japan, and Korea. The rose hips do in fact provide excellent winter forage for birds, deer and other wildlife. They also provide excellent shelter and many birds nest in them. It is a plant of edges and seems to protect exhausted agricultural land, and prevent further encroachment on woodlands. It is a definite "people plant" and likes to hang-out in areas disturbed by us humans. Collection: Flowers bloom in early-mid June. Each cluster will have flowers in varying stages of flowering- it's fine to harvest as long as some of it is in flower. No need to pluck off the stems unless you're making Rose Flower Honey. I like to collect a full cluster of flowers and 1-2 leaflets. I collect the collect leaves any time before frost. Collect hips after a strong frost. Uses: Flowers + Leaves- Helpful for recovering from gut inflammation from food intolerance. Reduces pain, heat and inflammation from wounds and skin abrasions, rashes, bites and stings- great first aid medicine. Sunburns and mild burns (especially the vinegar). Skin infections (cellulitis). Heart Tonic for the physiological heart and spiritual-emotional heart. Useful for trauma, sadness and grief, depression, anxiety, heartbreak. Heart-opening, and well known flower of love and devotion. Makes an excellent nervine- deeply calming and very fast-acting. Cardiovascular tonic, promoting proper vascular functioning, treating high blood pressure and poor circulation. Osteoarthritis ("wear and tear arthritis"), sore muscles, chronic muscoskeletal pain. Helps promote beneficial bacterial in our guts. Aphrodesiac, helpful for low libido, erectile dysfunction, frigidity. Relieves menstrual cramps, mood swings and scanty menses resulting from pelvic congestion. Combines well with safflower or hibiscus for this. Helpful for feelings of anger and frustration. Smooths Liver Qi. Helps with an overworked and congested Liver and excess heat in the digestive system. Signs include anger and frustration, diarrhea, constipation, headaches, IBS, gastric inflammation, food allergies and intolerance and sluggish digestion that stems from stuck Liver Qi. UTIs, yeast and vaginal infections. Major medicine in Ayurveda and Unani-tibb. Also used in Traditional Chinese Medicine (TCM) and Tibetan Medicine. Great for all classic Pitta (excess heat) imbalances. Ayurveda often combines rose with shatavari as a tonic. Use the honey for sore throats, to stop bleeding and help minor wounds heal. Hips- Nutritive, rich in Vitamin C and excellent for colds, flus and low immunity. Weakness, fatigue, dry skin and hair (signs of blood deficiency). Rich in bioflavonoids, important for cardiovascular health. Preparations: Vinegar, Infused Oil, Essential Oil, Salve, Cream, Honey, Rose Water/Hydrosol, Tincture, Glycerite, Elixer, Liniment, Infusion, Poultice, Compress, Flower Essence, Hand/ Foot Bath, Sitz Bath, Spiritual Bathing, Vaginal Steam. Liniment-25% Tincture/75% Oil. Tincture-50% Alcohol/ 50% Water. Glycerite- 80% Pure Vegetable Glycerin/20% Water. Elixer-20% Honey/80% Brandy. Vinegar- 100% Raw Apple Cider Vinegar. Dosage: Apply oil, salve, cream, liniment, compress and poultice liberally as needed. Honey- Eat liberally and as needed (you will probably "need" a lot!- it's amazing). Tincture, Glyerite, Elixer- Take ½-1 tsp 3x/day or more if needed. Can also be done in drop-dosing. Dilute a few tsp of vinegar in water for burns or use freely on food. Contraindications: Rose Petals contraindicated in early pregnancy because of blood-moving effects.